Personalized Coupon Mailers Custom Printed in Full Color in Bulk. No Setup Charges. Inexpensive. 5 1/2" W x 8 1/2" L. Budget Prices in the USA and Canada. 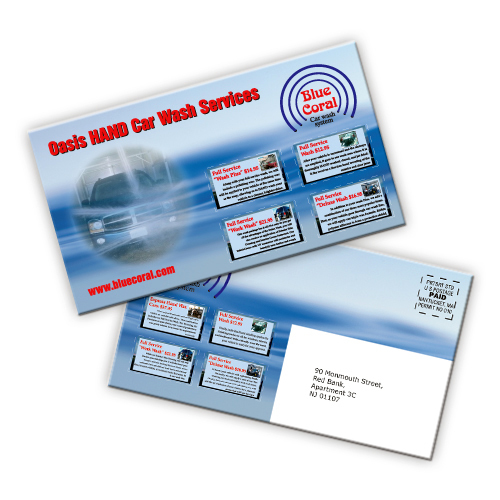 Wholesale advertising Coupon Mailers on sale. Standard stock mailer 10 pt. paper laminated on both sides. Free personalization on mailers. Great for fundraisers. Free set up and 1 Color to Full Color imprint. Free two sided imprint. Lowest cost in North America. American Clients pay no taxes. The unit prices below include you full color custom imprint. We also supply blank Coupon Mailers at EQP (End Quantity Price). *Mailers are not automation compatible mail. **Personalization must be supplied in a CSV file which can be created in Microsoft Excel spreadsheet format. Background images must be supplied as a jpeg file. Image names on spread sheet and image file must match exact. Approx. Dimension: 5 1/2" x 8 1/2"